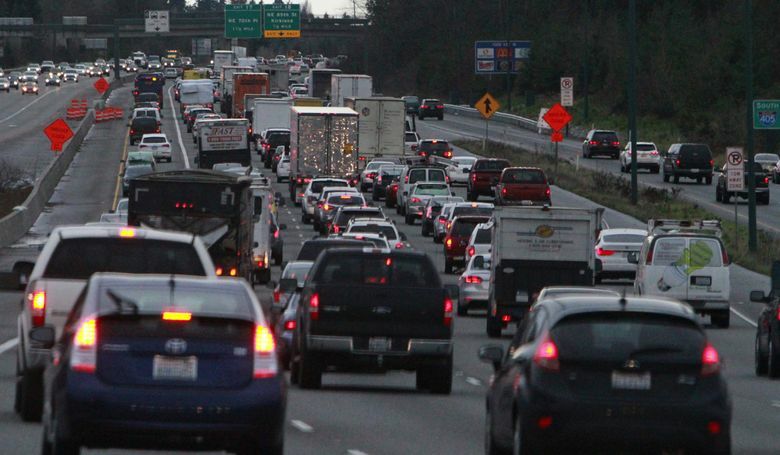 Community Transit and Sound Transit buses will be allowed to run along the right shoulder on two congested stretches of southbound I-405, in the mornings. Starting Monday some buses will get further reprieve from the congested southbound lanes of Interstate 405 in the morning. Community Transit and Sound Transit buses will be allowed to run along the right shoulder on two stretches of southbound I-405: between Highway 527 at the Canyon Park exit and Northeast 195th Street and between Highway 522 and Northeast 160th Street. Southbound Sound Transit routes 532 and 535 are the only routes that currently operate along that part of I-405, but Community Transit buses will also be able to use the shoulder while they’re out of service and traveling between routes. This comes just over a week after the new express toll lanes opened for those willing to pay to travel between Lynnwood and Bellevue more quickly during their morning and afternoon commutes. The shoulder-driving option will be available to Community Transit and Sound Transit fixed-route buses between 6 and 9 a.m. only when regular traffic is running substantially slower than posted speeds. Drivers will begin training on the shoulder lane on Monday and regular operation will start soon afterward, the agencies said.